to direct a patient to see the nurse or other health professional rather than a doctor where appropriate. however if you feel this an issue is very private and do not wish to say what this is then this will be respected. Call the above number to make an appointment with a Doctor or a Practice Nurse. We aim at all times to provide an efficient and responsive service and take pride in the easy access to health care we offer to all our patients. For urgent medical problems a Practice Nurse or Doctor will deal with your call. Please call us if you no longer require your appointment. This will allow us to offer your appointment to someone else. We are now offering online appointment booking with VisionOnline. Please sign up at the surgery if you would like to use this service as you will need to collect your username and password. The practice now has online booking for appointments. If you would like to book an appointment online then please speak with the receptionist who will provide you with details on how to do this. If you feel you need to see a GP sooner than the next available appointment, the receptionists will ask one of the GPs to ‘phone you to assess your symptoms further. This is known as ‘triage’. Please ensure that the receptionists have your correct phone number, and keep your phone charged and switched on, to avoid missing the GP’s call. 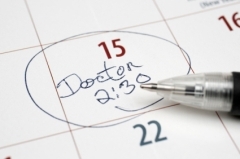 If the GP agrees that you need to be seen urgently, you will be asked to attend at a specific time. We now offer free appointment reminders via text message. A text message will be sent to your mobile phone with your appointment details. If you no longer need your appointment, you can reply to this message, using the word ‘CANCEL’. This automatically cancels your appointment and helps reduce waiting times for other patients. Please check with the receptionists to make sure we have your correct mobile number. If you are unable to attend your appointment, we ask that you cancel it at the earliest opportunity. Failing to attend appointments wastes time and resources, and prolongs waiting times for other patients. Patients who miss several appointments will be notified in writing, and encouraged to make every effort to attend future appointments. Regrettably, if patients continue to miss appointments despite this, they may be asked to register with another GP. As an accredited training practice we offer appointments with fully qualified doctors who are specialising in general practice. Doctors may be at various stages of their training and are, at all times, fully supported and supervised.